Today, we are celebrating, Mothermark at Splitcoast…otherwise known as Cindy. Cindy founded the teapotter’s challenge and has put countless hours of time and effort into it. Cindy is stepping back and some other fabulous stampers will continue to carry the torch. So my valentine will be going to Cindy as a thank you. Another very simple…15 minute or less design. My card starts with a regular A2 card base in white, topped by some black card stock that’s been dry embossed with a dotted folder. Next comes a beautiful heart shaped doily that I’ve hoarded for a while. Then a die cut circle of SU! Melon Mambo that’s been sponged around the edges. 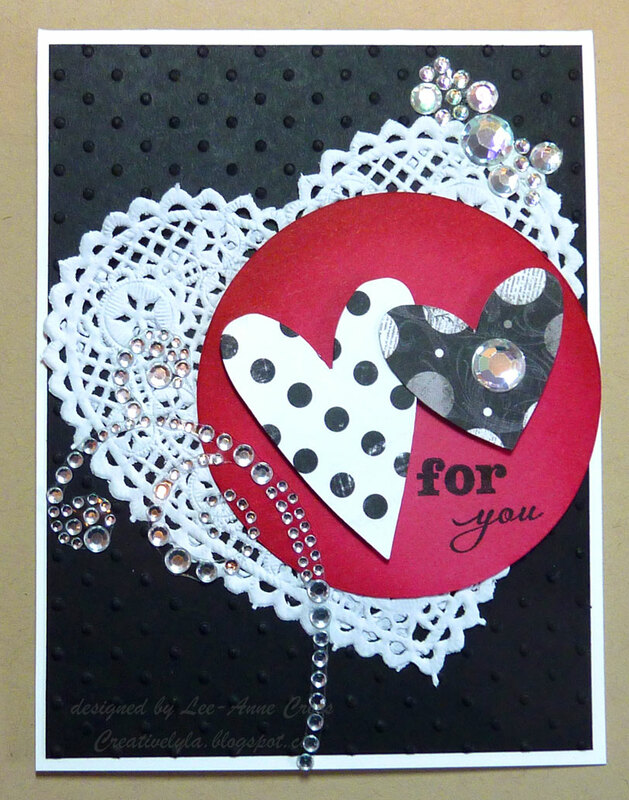 Two more die cuts in a designer paper, a stamped sentiment and added bling…done! Easy peasy right? That’s it for today stampers…see you soon with more! Cindy will love this with the polka dots for sure! A fantastic valentine Lee-Anne! This is so pretty, Lee-Anne. I love that awesome heart doily and see why you've hoarded it. I am also a dot lover so you know I'm loving your card.